A public ribbon-cutting celebration for Spokane International Airport’s new rental car facility is scheduled for next Wednesday at 10:30 a.m. at the airport’s ground transportation center. Picking up and dropping off rental cars at Spokane International Airport has gotten a little more convenient for customers and a lot more efficient for the eight rental car companies operating there. A $14.1 million facility opened earlier this month with covered breezeways and waiting areas, customer service kiosks and added parking for 231 vehicles coming and going from the airport. Rental employees are there to speed passengers to boarding gates. Unlike many airports, where passengers take shuttle buses to off-site lots to rent a car, the new rental-car facility at Spokane International is within walking distance of the main terminal. 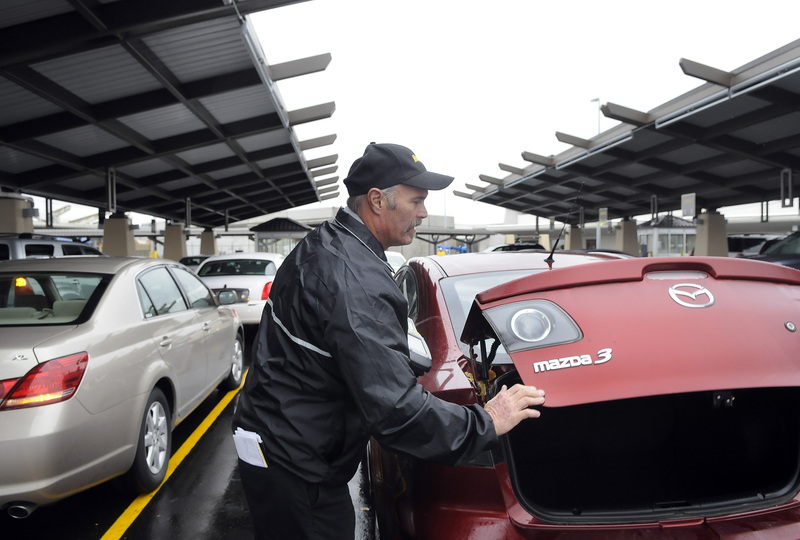 “Our cars are right out the back door,” said Mark Tellvik, station manager for Hertz. Craig Zoellner, of Denver, said he appreciated the time he saved on his trip to Spokane this week. His son, Andy, is considering attending Gonzaga University next year and the family flew in to check out the campus. Zoellner said he liked being able to walk out the door and hop in a car. On the return, customers are directed to a new entry off Flint Road, leading to covered drop-off lanes. “You just drive right up. You don’t have to worry about trying to park,” Tellvik said. The rental car facility, designed by Cortner Architectural Co., of Spokane, is intended to meet passenger growth at the airport for the next 20 years. It consolidates facilities for the eight rental companies while providing more room for vehicle circulation. It has improved pedestrian safety features, and security systems to protect the airport and airlines. In addition, rental car companies are now sharing a 22,000-square-foot service center with 10 bays for fueling, cleaning and light maintenance. The service center is improving the companies’ turnaround time for returned cars. Overall, the rental facility has room for 586 vehicles. The project was financed through 10-year revenue bonds that are being repaid with a $3-a-day customer facility charge on rental vehicles. Graham Construction of Spokane and Inland Paving and Asphalt did the work.